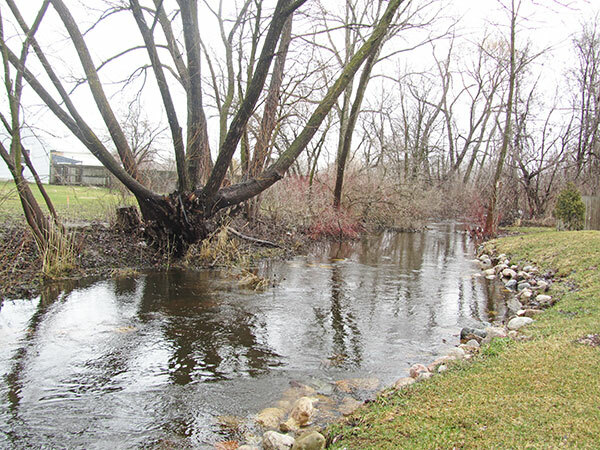 Tag Archive | "trout study"
Cedar Creek, shown here with high water in 2013, has been chosen for a trout study. Post photo by J. Reed. Cedar Creek, one of Cedar Springs’ greatest natural resources, will benefit from a $60,000 research project. A new partnership between National Trout Unlimited, Schrems West Michigan Trout Unlimited, the Cedar Springs Community Building Development Team (CBDT), South Peat Environmental, and researchers and students from Grand Valley State (GVSU) has been formed to better understand and improve Cedar Creek as a cold water resource. This $60,000 research project is being funded by the above organizations. 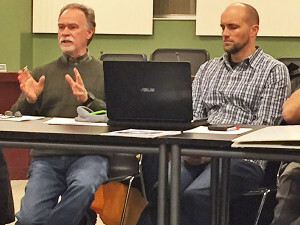 Dr. Mark Luttendon, Professor and Biology Graduate Program Coordinator at GVSU and Joshua Zuiderveen, Owner of South Peat Environmental recently outlined their project at the CBDT meeting and gained the organization’s support. 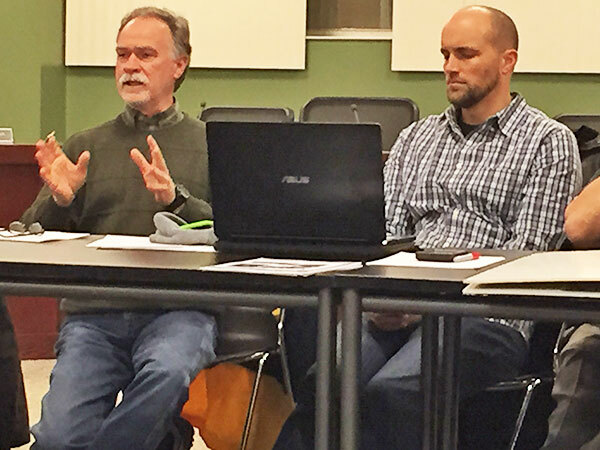 Mark Luttendon, of GVSU (left), and Josh Zuideveen, of South Peat Environmental (right) outlined their trout project to the Community Building Development Team. The partnership will combine forces to evaluate current conditions in Cedar Creek, and using that information, implement projects that will enhance the resource. The general plan is to let the fish show us where they prefer to be, then members of the partnership will try to figure out why. To do this, a group of Grand Valley State graduate students will surgically implant small radio transmitters into ten brook trout. The transmitters allow the students to locate a fish to within 1 square yard of its exact location. The transmitters will also be equipped with a tiny temperature sensor, allowing the team to determine the internal body temperature of a fish at any given moment. The hope is that the fish will show the research team where water temperatures are the best for brook trout. From this information, managers can develop plans to build habitat within the stream that will enhance conditions for trout living in Cedar Creek. Knowing where the best water conditions are within Cedar Creek will also help managers to protect those areas in the future. The project will happen in conjunction with Schrems Trout Unlimited’s Kent County Brook Trout Project, a grant and municipally funded endeavor that improves conditions for trout, including brook trout, in several Kent County streams including Cedar Creek. The project is slated to begin in May 2015 and run approximately five months. The general public is invited to participate and observe the transmitter implantation process. More details will be released later this spring. “This is another wonderful partnership that has been created in support of the CBDT’s vision of enhancing the community’s natural resources,” said Kurt Mabie, President of CBDT.